DocuFreezer / How To / Convert XPS to PDF for Free! PDF remains the most popular format for archival purposes and document workflow. PDF does not allow any amendments – it will carefully save the information to represent it on any electronic device of any origin and exactly the same, which makes it ideal for achieving documents. Offering unprecedented solutions, it is preferred over its alternatives by individual customers, small-sized companies and large corporations dealing with electronic documents. Still, it is not the only format available for satisfying document processing criteria – XPS developed by Microsoft can fulfill the same tasks, but still, has not been able to surpass PDF in its popularity. XPS is the XML-based format offering a very simple structure that developers appreciate. For example, developing an XPS viewer will take much less time than the one for PDF. Average customers though prefer PDF for its universality. Thus, XPS remains the second to PDF for sharing and archiving documents. The necessity to convert XPS to PDF is quite frequent and requires special software. DocuFreezer is the software developed for fulfilling various document conversion tasks. Conversion of XPS to PDF will only take a few seconds: select the files to convert, add them to DocuFreezer and click Start! In case DocuFreezer is used for personal needs, there will be no charges for document conversion. 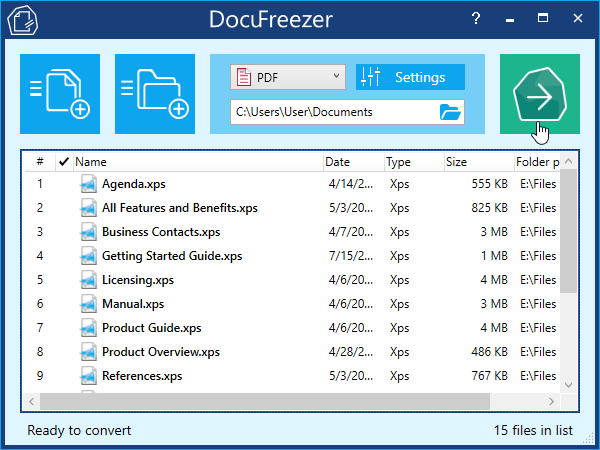 Convert XPS to PDF and HTML to PDF with DocuFreezer 1.1 for Free!